Incident follows similar collision in which bridge collapsed, killing a truck driver. 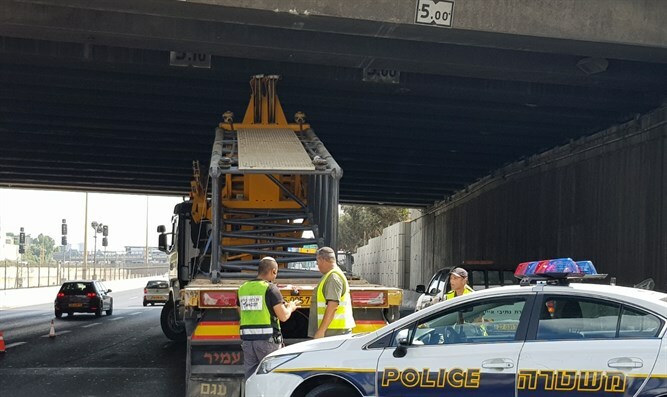 A truck carrying a crane collided with a bridge in Tel Aviv Tuesday afternoon. The incident occurred at the at the La Guardia interchange on the Ayalon Highway. No injuries were reported and the damage to the bridge was minor. Police closed two lanes until the truck could be removed. The police reported that "We received a report of a truck with a crane that struck the La Guardia bridge on the Ayalon Highway on the southbound side. At this stage there are no casualties and the truck is stuck under the bridge. The traffic and mobility department is in place and directing traffic. 2 out of 3 lanes were blocked to traffic on the southbound side. Drivers are asked not to come to this area and to take alternate routes."